Jo Deul-Ho (Park Shin-Yang) grew up in an orphanage, but is now a promising prosecutor. His wife (Park Sol-Mi) is an attorney and the daughter of a big law firm CEO (Kang Shin-Il). They have one daughter together. Jo Deul-Ho's life is about to change drastically after he decides to prosecute powerful CEO Jung (Jung Won-Joong). Jo Deul-Ho learned that his close childhood friend from the orphanage was setup as the fall guy in a fatal arson case caused by CEO Jung's own son. While prosecuting CEO Jung, Jo Deul-Ho is framed by those closest around him and is charged with accepting bribes from the defendant. His career is effectively over. 3 years later, Jo Deul-Ho is now homeless and lives on streets. He happens to meet Lee Eun-Zo (Kang So-Ra) who mistakes him for a pickpocket. Lee Eun-Zo is a rookie attorney and works for the law firm run by Jo Deul-Ho's ex-father-in-law. In front of him, his close childhood friend is hit by a truck and dies. After his funeral, Jo Deul-Ho learns that the police have arrested a new suspect in the fatal arson case. Jo Deul-Ho begins his new career as a lawyer. Takes over the KBS2 Mon & Tue 22:00 time slot previously occupied by "Babysitter" and followed by "Becky's Back" June 6, 2016. Hotelier Nov 29 2017 11:50 pm Kang so ra and ryu soo young's character has a good chemistry (kinda awkward but in a good way), so i hope they bring them back in season 2. I wonder why the suddenly removed one of Dae soo's assistant, kim doong joon. His character suddenly disappeared around episode 9...after power drink case. Which is weird because he always stick around Dae soo. sega circolare Nov 17 2016 6:32 am I enjoy reading a post that will make people think. Also, many thanks for allowing for me to comment! bee Aug 15 2016 3:15 am I really love this drama. The story was awesome, but since the scriptwriter changed, I thought park sol mi's role had more scenes than the leading lady, kang sora's role. Also, detective role played by hwang suk jung had more important scenes than kang sora's. I didn't get the point of kang sora's role. It was an odd because she should be the leading actress. I think kang sora is good actress, I was hoping more about her role. A little disappointed. Regardless of those opinions, this drama is recommended. intn Aug 08 2016 8:52 am Always love Park Shin Yang....he played the role Mr. Jo very well!!! nchuhae Aug 05 2016 10:12 pm I dont know why kang sora's role become less important since the last six or five episodes. it feels like she's remain there just as supporting actrees. doesnt really matter, actually, cause the plot itself is so good and entertaining,but as someone who watch this drama because of her, it was kinda disappointing for me. same thing also happen to kim dong joon who suddenly disappear in the middle of the story. i dont know if theres anyone else who pays attention to his presence. Fanny Jul 26 2016 10:50 am Seems Kang Sora is just being a skin care advertising...A.H.C...her roles is not too important in this drama. I hope she will be a real lead actress for her next drama. But overall I really like this drama...eventhough the story is about lawyer and prosecutor but it still a lot of fun and not too serious. Saint-Jacques-de-Compostelle Jun 21 2016 11:17 am Kang So-Ra is the real highlight of "My Lawyer, Mr. Jo". It's the first time I am seeing her, and it's a revelation for me. Her facial expressions are flawless, and she's visibly putting a lot of care in her acting. Unfortunately, they only gave her a supporting role, and her character gets less and less screen time as the drama develops. I hope that next time I see her, it will be in a leading role. vicyy Jun 09 2016 11:47 am i think kang so ra will ended up with ryu soo young. I dont care with whom the will ended with. but i love this drama!! Gert Jun 06 2016 9:13 pm Loved this show, only one more episode to go (tomorrow night). waone Jun 03 2016 4:12 pm why in every drama PSY still ending up single ? Nicey Jun 03 2016 4:32 am @goodie, Whatever! For me, this drama is not for those who are looking for Romance Com Drama, like me. There is no love line, this is purely a Legal Comedy Drama. Others will like, but this is not my cup of tea, that is why i am disappointed. Sorry, just honest. joe osborne Jun 01 2016 7:30 pm KDrama with each new series keeps getting better and better. I love these empowered characters that are being developed. I think everyone is definitely tired of the Mother Theresa characters in previous Kdramas. Now we are seeing character development on par with the true way people react to treachery and abuse. The lead kept coming and coming and never gave up and in the end he overcame all the evil characters and made them receive their just desserts. Nicey Jun 01 2016 4:10 am @Goodi, look at the poster, Park Shin Yang and Kang Sora are the only actors in it so big and so clear so i thought they are the main lead actor and actress. Anyway, i have my own choice, i stopped at ep 15 because i am a fan of Kang So Ra and watched this because of her. And You can not do anything about it, that is my choice. Okay. Danniah Jun 01 2016 12:59 am I can't believe this drama is over. Thumbs up for drama's team because they can keep the flow consistent. All casts potrayed their charachters very well. I love the final episode, it makes the most sense, esp for romance thing. And, I could easily notice the work of the director Lee Jung-sub here in strange ways. Hahahaa.. If you have watched Healer, Glory Jane, and King of Baking, you can understand what I mean. The plot twists and everything are soooo "Lee Jung-sub's style"
touch May 31 2016 9:15 pm Finally it has reached the ending and also it's and happy ending. After 5years comes back he still good Park Yin Sang. But one thing I really doubt about is. The big chubby cute guy who is Daesoo's follower. He is appears till the very end BUT i don't think writer gave him a script. He just remain silent and smile. And I don't even know his name in this drama. No one called hia name.at least let him say something or call his name. And as I check the drama cast He is not listed in the cast list. This one thing i really disappointed in this drama. Anyway I love this drama. It's so cool. Andi May 27 2016 4:01 am really so good drama..
Davia May 26 2016 4:54 pm Brilliant drama. One of the very best dramas I have ever seen. It's both incredibly exciting and funny. The acting is riveting all around and Park Shin Yang has now become one of my favorite actors. I hope he wins an award for this role. He really deserves it!!! Nicey May 25 2016 8:43 am I watched this drama because i thought the main lead actress here is Kang So Ra, but as the story goes, 95% sure that Lawyer Jo will end up with the ex wife. I stopped watching at ep 15. In the last few eps, Kang So Ra is not the the leading lady, she is only a support, the actress portraying the ex wife has more scenes. I am disappointed. To you guys who want to watch, this is purely drama about Law and is a comedy drama, with Zero Romance. janet May 22 2016 8:10 am utterly enjoyable to watch. don't want it to end! Kudos to the whole production team. Also, Many thanks to KBS. Nicey May 21 2016 11:30 pm @Hopper I have my own opinion, mind your own business. Even Action dramas and movies, they have some part of romance in it, Okay. Hopper May 21 2016 5:22 am This drama is good to watch. Plot is very nice and dear writers plz don't throw in any unwanted angles like romance into this unless it does any justice to the story. Nicey May 21 2016 12:00 am Park Shin Yang acting here is really exceptional! I will guarantee you this drama is worth waching. Mr Jo does not deserve the ex wife, for she did nothing when his husband was framed by the Chief Prosecutor and her own Father, instead she filed a divorce. Yes she is real pretty gorgeous outside but not inside. Mr Jo deserve a good woman beautiful inside and out, that is why i am rooting for Ms. Lee. My only opinion. Nicey May 18 2016 9:20 am Two main leads, Park Shin Young nd Kang So Ra have good chemistry even if they have big age difference in real! Hope we can see some romantic scenes between them for this drama to be perfect! I love them both. Will wait for the last six eps. Good luck!! annz May 17 2016 6:57 pm new scripwriter,plot and cast that effective impact that the upward rating.Daebak!! Nicey May 17 2016 8:37 am Yes, i think the two main leads PSY and KSR has good chemistry, let them be together in the end. Romance is missing in this drama for it to be perfect! Not too late, there are few more episodes left. We are waiting..! Davo May 14 2016 5:52 am Great drama to watch. Need something real good to keep up with hype created by "Descendants of the Sun".....and "My Lawyer, Mr Jo" did it!!! red May 13 2016 9:58 am why did kim dong-joon disappear in latest episode :( i keep wanting to see mr.jo's daughter again..in all, this drama is great! watch it! Dinam May 13 2016 6:13 am Love this drama,Park Shin Yang daebak!! Anastasia May 11 2016 5:35 am I love this drama especially the casting, they are all great. Its sad, its funny, its intriguing. It gives us a glimpse of the justice system in Korea, in and out of court. Dee May 10 2016 9:25 pm This is his first drama after 5 years and he is still soooo good. This drama is interesting and the plot is good. One thing disgusting is that JDH is wearing the same suit for so many episodes!! Yes, he is poor but please let someone get him a new set of suit. He sleeps in it, he goes fighting in it and he goes to court in it!!! I cannot imagine the smell!!! Windy May 09 2016 8:41 pm This is Korean series I love the most. Two thumps up. Bernice May 09 2016 8:13 am I am not a fan of Korean drama series, but honestly, this is the only Korean drama I am now watching. Beautiful. Highly recommended. The lead actor did it well, also the supporting ones. Well, the script maybe missed important logics especially in law, but as a drama, law is beautifully presented and....touching. Two thumbs up! ~salmos~ May 04 2016 4:15 am Is there any love line here? Almond Apr 27 2016 6:39 pm This is a great drama with a great cast and great acting. 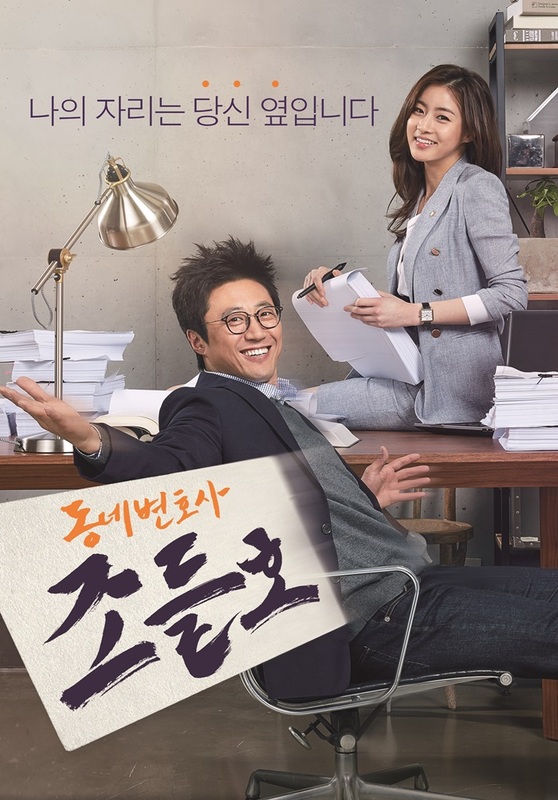 Although the plot is a little overdone, the production and directing is so entertaining and refreshing to watch (Which makes it more than just another law drama). I'd definitely recommend watching it! Mary Apr 27 2016 1:02 am I highly recommend watching this new KBS drama! Park Shin Yang is so adorable and his acting is extremely good! He is perfect for the role. I really enjoy watching this Korean drama! JJ Apr 20 2016 6:16 am Really touching... one of the best drama in 2016!!! Must watch!!! Bob Cheong Apr 18 2016 7:54 am Why did Jo's wife leave him...because he was righteous...because he was honest? She rather have her daughter grow up with a crook for a grandfather? Coco Apr 14 2016 5:36 am Interesting drama. Amazing actors!! The people who are with Joe Deulho are all amazing including the 3 gangsters (i think) and the other lady. They're funny and they keep things amazing along the way! Great great drama. Can't wait for the next episode! Well, my first time seeing Kang So Ra acting, not bad though. Alaska Apr 11 2016 7:29 am Interesting story line and good acting by the leading man. But somehow the camera crew isn't doing a good job as the shots are very shaky and not smooth. It gives me a headache after watching the drama for five mins. A pity to ruin such a fantastic drama with poor technical support! Raisha Apr 03 2016 12:47 am Wow, it have been a few years to be able to see Park Shin Yang on tv's drama. He is always a good actor as far as i can remember. Looking forward to this drama...Fighting!!! nemo Apr 02 2016 12:18 pm can't wait for next episode. this drama is exciting. kudos to park shin yang..his character is so much fun to watch. so charismatic and also funny at times. don't care bout the age gap between the leads. park shin yang doesn't look too old i think. phoebe Scott Apr 01 2016 7:26 am no need to complain we should wait and see the movie but pls it should not be like (REMEMBER WAR OF THE SON). krakd Mar 28 2016 8:47 pm another dramatic entrance into the court room, except park shin yang is a lot more convincing as a lawyer than yoo seung ho. kang so ra was so pretty in misaeng, but something doesnt look right here, the cheeks or the laugh lines around the mouth? dont have much confidence with kbs as compared to tvn or other cable networks, but this first episode wasnt bad. popcorn and coke Mar 23 2016 3:41 am After watching Ugly Alert i can't imagine Kang So-ra being paired to other leading men other than Lim Ju-hwan..They were too perfect as a couple..
ming_aaa Mar 20 2016 7:45 pm Shin yang oppa is back on TV screen after 5 years. This can just be the only reason I will watch this drama but it's not. With all these teasers and trailer, I'm so excited for this drama. I can hardly wait until next week. Age is just a number. These wonderful casts are great actors and actresses. They're professionals and great in what they do so the audience will soon forget about this age thing and believe in their characters and the story. Batool Mar 16 2016 11:43 pm Okay!! I don't care what... I just can't wait for this drama!! Seriously!! Just the teasers ante so good and funny!! I like Kang So Ra and Park Shin Yang they both are great actors!! But also gotta agree not together- no romance! The age gap's huge bro... Peace out!! Bouchra Siroua Feb 29 2016 11:56 pm Why is everybody complaining?? We don't even know what the drama is about and what will be so ra's role in this one! It is just like a new leaf when park min young was paired with myung min, they're was no love line but it was a good drama ( except for the ending), even if there is a love line where is the problem? Yoo ah in and park seo joon were once paired with older actresses and their dramas turned to be a success So we have to wait for at least the 4 first episodes to judge the drama and the cast! Sora Feb 18 2016 8:59 am Why is Kang Sora getting paired with old ahjusshis. I mean they might be great actors and all but she's too young to be paired with them they're so old. If the story has no romance absolutely, then it's fine though. baesr Feb 18 2016 2:57 am OWW EMMMM GEEEEE!! Bony Feb 07 2016 10:20 am Just maybe this drama look like "healer", if Ji Chang Wook cast here, Park Shin Yang is main male lead, but no love relationship with So Ra, but Shin Yang will be play like Yoo Ji Tae in healer. Just my opinion. Ociw Feb 03 2016 8:22 pm Please ji chang wook, park shi yang is too old! prijanka Feb 03 2016 1:10 pm OH MY GODNESS... yesterday I JUST SHOCKED of knowing about FLOWER IN PRISON couple, where Jin se yeon and Ko soo is 16 years distance! and now I'M VERY SHOCK knowing KANG SORA PAIRED WITH PARK SHIN YANG WHO IS 22 YEARS OLDER THAN HER?!!!!! OH MY GODNESS... shin yang match to be her DAD... or UNCLE.... -_- its really doesn't make sense!!!! Isn't there any others senior actor???? If the writer really want senior actor for the lead male, why don't take I mean maybe like Jang Hyuk?? Ji Sung? ?or Uhm tae wong?? They are much better than shin yang! Sorry to say this. ain Feb 02 2016 7:01 pm i heard that kang sora love to work with senior actor right? but i think park shin yang is too old for him :( yes i agreed why not ji chang wook? Kfaantastic Feb 02 2016 12:00 pm @hyungjin agreed! I'd rather have Kang sora paired with someone else. Or She doesn't need to be a love interest to shin yang! Hyung Jin Feb 02 2016 6:26 am Please cast Ji Chang Wook to lead male. Kang So Ra is pretty and good artist, but Park Shin Yang is too old for her. Hary YK Feb 02 2016 3:03 am Wow, kang so ra is casted in this drama. (ill be waiting this).